The Greystones golfer will start his final round in third place, seven shots behind Tyrrell Hatton. Dunne: "I need a seriously low one tomorrow" (file photo). PAUL DUNNE IS in the mix for another big European Tour payday on Sunday at the Alfred Dunhill Links Championship. But the Greystones golfer knows that he will likely need a red-hot finish to have any chance of reeling in runaway leader Tyrrell Hatton. Dunne shot a two-under par 70 on the Kingsbairns course, leaving him in third place on -11 ahead of the return to St Andrew’s for his final round. But he is seven strokes adrift of Hatton, who laid down a marker with a magnificent bogey-free 65 as he bids to become the first player to defend the championship. “Two-under was ok considering the conditions and how I played,” Dunne told the European Tour afterwards. “I didn’t play that well. “All in all, 70 is a decent return. I’m not totally out of it but I need a seriously low one tomorrow by the looks of how Tyrrell is playing. The winner will receive a cheque for €676,000 but if Dunne can hold on to third place, it will guarantee him more than €250,000 in prize money, taking his earnings to over €800,000 in a fortnight following his maiden tour win at the British Masters last week, and potentially nudge him into the top 10 in the Race to Dubai standings. “I’ll just try to get off to a quick start,” he said. “I think there’s going to be less wind tomorrow, and if it’s the same direction, that means scoring will be pretty good. Shane Lowry is tied for 18th on -7, a shot ahead of Graeme McDowell, while Rory McIlroy just squeezed into the field for the final day on -4. Email “Another big payday beckons as Paul Dunne looks to chase down Hatton at Dunhill Links”. 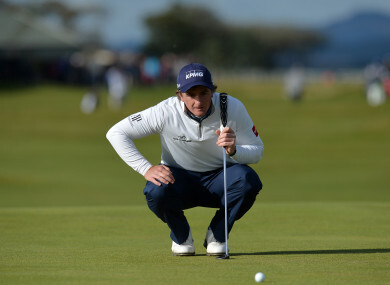 Feedback on “Another big payday beckons as Paul Dunne looks to chase down Hatton at Dunhill Links”.